Benny’s Moving and Storage–A professional job at an affordable price. When you need to move your home or office call the best moving company in Boston. What makes Benny’s Moving and Storage one of the best movers in MA? Benny’s Moving and Storage has been serving greater Boston and New England for over 22 years. We have earned an A+ rating from the BBB (Better Business Bureau) and are Pro Certified by AMSA, the American Moving and Storage Association. Known for customer satisfaction and extremely responsive customer service, Benny’s has enjoyed a reputation for excellence that keeps customers coming back and telling their friends, which is why over 60% of our customers are return customers and referrals. With a Professionally trained office staff and Professionally trained moving teams, foremen, and drivers you can expect reliable estimates and on-time pick up and deliveries. long distance relocation, piano moving Boston, packing services, box delivery, and junk furniture removal and disposal. Our professional movers have many years of experience. They can pack your entire office or household quickly and efficiently. All boxes and items are recorded on a detailed inventory list, so what is put on the truck is what comes off the truck at your new destination. Why is Benny’s Moving and Storage one of the best long distance moving companies in Boston? 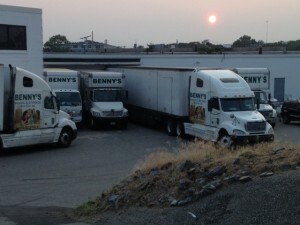 Because Benny’s Moving and Storage owns and operates its own fleet of tractor trailers and runs weekly trips from the east coast to the west coast. What does that mean for you? It means that when you book a long distance job with Benny’s Moving, your items are picked up and delivered on time. We offer pick ups across the East Coast from NY NH RI CT MA VT ME NJ MD VA DC DE PA delivered to the entire continental United States. We offer same day and next day delivery to NY NJ DE VT ME NH PA MD DC VA CT.
We offer a guaranteed flat rate for local and long distance moves and free in home estimates for large jobs. Benny’s offers both short term and long term storage and maintains a 25,000 square foot private facility. I want to recommend Benny’s long distance Movers to anyone planning on moving from Boston to Chicago. My guys were Terry, William, and Galindo, and they were really nice from the get go, all introduced themselves, and then proceeded to do what was probably one of the worst moves ever – I moved from a 3rd floor in the North End to another 3rd floor in the down town Chicago with awful stairs on a day it was 85 degrees out. They worked SO hard to get my furniture up the stairs even though it absolutely did not fit. I was beyond grateful for all their hard work, and the price was incredibly low I paid $2500 and received my items in Chicago with in 7 days. It was some of the best value deal. As our moving date coming soon we made a call to Benny’s moving and storage this week to ask if they could fit us in for moving from Boston to Texas, this July. This reminded us of last year’s move (June 2013) when they moved us from Cambridge to Newton. It was then that we realized what a great choice we had made choosing Benny’s moving and storage. Last year we decided to move on a Sunday. That Friday it started raining the weather channel had been announcing a major storm. We decided to push the move back to Friday literally the last possible day we could move, since our lease would be up and we had work that entire week after. Terry and his team were so flexible, and they moved our move date to Friday even though we gave them a 24 hr notice. On Friday the movers started moving our boxes and furniture into the truck and they drove to the storage before loading it to a large tractor trailer, 10 days later we received our belongings without any damages in Dallas Texas. Long distance moving can be a highly time consuming and tedious job, without proper support. Moreover, by assistance, it does not only mean the friends and Neighbours who pitch in to help you out, but a professional assistance, like a long distance moving company. There are many movers in New York who provide help with the long distance shifting, at an affordable rate. Here are a few things you can avail from them, to make the shifting easier. • Packaging services Since you are shifting to a place quite away from your present location, simple or haphazard packing would not do for you. To prevent any damage to the materials during shifting, you need to pack them very carefully. Doing it with a professional help, like employing the packaging services offered by the long distance movers, can come in handy. • Liability services Insurance is a must, while you are moving from one location to another. Having your precious things insured and secured can help you to relax and enjoy the last few days in your old city. Again, here too, long distance movers can help you out. Most of them have excellent liability solutions and provide insurance of all kinds. • Storage services The moving companies usually have allocated space as ‘storage spaces’ for those who would like to store their items to be picked up later on. So, in case you are relocating from New York only for a few months and would like to come back again for your things, you can use this facility. • Moving facility Now, this one service is entirely necessary to the whole shifting process. With a completely secured vehicle to do the relocation process, you can experience stress free shifting from the New York City. Are you on the verge of relocating your house or office to a new location? Then, the most primary aspect which needs your attention is the planning. A well-planned and organized shifting can be stress free and less time consuming. Let us figure out what all should be planned, before the actual deadline. • If you are making a local shifting, make sure that you employ a local mover in Boston, to help you out. However, before approaching them, take care to list out the things that are to be shifted the distance between the two locations and also the day you need to shift. • Next, get a list of local movers in Boston, either from your friends or through the websites. If you are getting it from your friends, ask them about their experience with these movers. • The moving companies would like to visit your premises long before the date of relocation, to decide on many things as the number of trips required and the size of the vehicle to be brought in. • Now, once you have fixed the best mover in Boston, concentrate on the packing. If you are clueless about how to go about it, ask for assistance from the moving companies. From packaging material to even assisting in the packing itself, they can guide you in well in all these matters. • With good packaging materials and also a little help from outside, you can finish the packing well before the destined date. However, if you do not want the hassles of packing your things, you can alternatively employ the packing services offered by the moving companies. Since they are experts in this sort of thing, the whole job can be finished within a few hours. Browse online to get hold of a moving company who can perform all these tasks at an affordable rate and help you save money during your relocation. As the saying goes, ‘prevention is better than cure,’ it is always beneficial to take all necessary precautions before repenting later on. So, in case you are thinking about shifting, pick out one of the best insurance coverage available with the moving companies in Rhode Island. Insurance policies offered by the moving companies come with many advantages. One of the best benefits of an insurance policy is that it would secure your precious and valuable items, in case of any mishap during relocation. Every household contains many things that are invaluable to their owners. When one relocates to a different long distance location if anything happens to these things during the freight, having a good insurance can allow you to claim at least the monetary value of the lost article. Taking an insurance policy from a moving company has a significant advantage. You can have the option of insuring each and every article and facts separately, and so, can get a repayment for any lost or damaged article from the moving company itself. Since they are going to handle these things, you are indirectly ensuring that the items would defiantly be handled with care. Otherwise, they are going to pay you back for any damage. Since you would also be employing the moving services apart from the insurance policy, you can get a better and a quicker claim in case of any mishap. You can get a better redress from the moving companies because they are responsible for any harm caused to the articles during the freight. Another factor which makes purchasing the insurance policy from the trusted Boston moving company more attractive is the cost to be paid initially. As a prospective customer, you have the option of bargaining with them and also ask for discounts in the insurance policies. The basic idea behind taking insurance during relocation is to protect our goods from destruction. Who better than the moving companies then, to do this job for you? A complete line of moving supplies for the do-it-yourself mover in Waltham, MA Fastlines moving boxes are specifically designed to make packing and loading easier. We have products to meet all of your moving needs from small boxes to large boxes, china boxes to wardrobe boxes. Whether its boxes, packing tape, bubble wrap or any other type of packing supplies, Fastlines movers wants to make moving that much easier for you. We offer free shipping to Waltham, MA, 02453 or anywhere else in the continental U.S. on all orders over $100, or choose in-store pick up at Storage Plus for same-day service! Found Benny’s moving on yelp and got a quote by Stephen. Found Benny’s moving on yelp and got a quote by Stephen. Setting up this appointment was very easy and they got right back to me. My move was this past week for a moving from Boston to Florida. I have nothing but great things to say.. A+ movers. I agree with other reviewers, they were due to show up at 8:00 am and they showed up at 7:50 am so a bit early but in my book better early than late. Three tall men showed up spoke with me what needed to be moved and I showed them and they were on their moving way. I opted for additional insurance which was a great price and worth every penny. Nothing got damaged cause these guys were careful and knew what they were doing. I moved into a place with new hardwood flooring which is very prone to scratch. Even the slightest movement can cause a scratch. Not a scratch was made or any dents these guys were awesome . My management company even commented how great they were and they are going to let others that need to move their number.